Sebastian – Private Cert – Finally!! 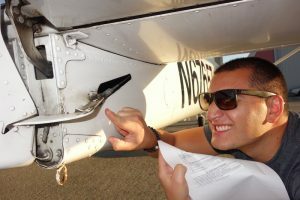 Pacific Skies AviationSebastian – Private Cert – Finally!! A long journey that took many tries to achieve due to weather finally became reality! After many attempts trying to depart KTOA and the weather not allowing me to, we all came up with the idea of flying a day before to KCMA and not run chances. Thats how it was done! After a good night sleep in Camarillo, off I went to for my check-ride. It was a long day but exciting to finally be there. It was successful, I passed and never more motivated to get back in the air and continue achieving goals at PSA !! The examiner has a special thing for these cotter pins. 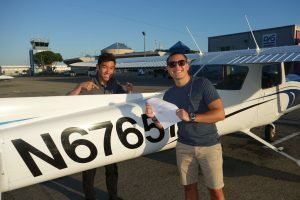 Sebastian and Instructor Jon celebrating the successful return to KTOA.